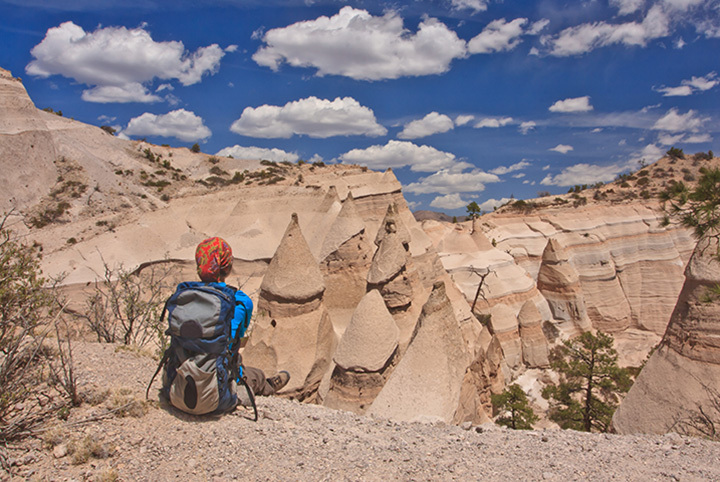 Hiking in New Mexico is a mix of grueling long distances, refreshing walks with captivating vistas, treks to hidden historical sites and climbs to the highest peak in the state. Experiencing the outdoors here in this land of enchantment is, indeed, great. Wherever your hiking boots take you, the sacred winds that blow across the state will carry you along to some of the most dramatic sites you’ll ever see. Just be sure to take along some water! The tramway at the top of the Sandia Mountains, just outside of Albuquerque, isn’t the only way to get to the top of Sandia Peak. You can take La Luz Trail, too. This eight to nine-mile hike is not for the slackpacker. This is a strenuous and difficult trek with a 12 percent grade and close to 4,000 feet of elevation gain. The final stretch has a series of 19 switchbacks, presumably to make the getting-to-the-top endeavor a little easier. Best time to go is spring, summer or fall. Winter brings with it snow. A thought: hike up … or down … and take the tram as part of the experience. Near the Four Corners area are 41,000 acres of wilderness known to the Navajo in part as “a large area of shale hills.” The second part, De-nah-zin means cranes which the hoodoos, pinnacles and columns of weathered rock that spot the skyline, just might resemble. This remote area, an other-worldly land of geological curiosities managed by the Bureau of Land Management, is a trek into an evoca-tive land of small gullies, rolling dunes, contorted rock outcroppings and easily-traversed arroyos. You can map your own trail, since there are no definitive signs of any. Best time to go is early spring, before the heat. Take your GPS and plenty of water. Wheeler Peak is the highest mountain in the state, part of the Sangre de Cristo Mountain Range which is, itself, a subrange of the Rocky Mountains. This is, to be sure, a mountain hike. With 3,000 feet of elevation gain, across avalanche paths and through scree fields, the eight-mile round trip is a long day-hike. Along the way, you might see marmots, elk, mule deer and the ever-elusive bighorn sheep or pika. A strenuous hike that’s best done when there’s no snow … spring and summer months bring wildflowers and warmer weather. Watch out for the weather though, it’s unpredictable. For sheer awe-inspiring geological wonders, you can’t beat the short, but intense, three-mile Slot Canyon Trail hike here. Drop down into a slot canyon through a world of 90-foot spires of tent rocks, also known as hoodoos, fairy chimneys or earth pyramids, and uncover a land created by volcanic eruptions that layered the area with pumice and tuff which wind and weather then shaped. The rock strata are colorful amalgamations of pink, brown, grey and mustardy-gold, in stark contrast to the “white cliffs,” the traditional Native American name. June through September is monsoon season, so be mindful of flash flooding. Take plenty of water and $5 for the entrance fee. This five-mile, moderately-easy hike, at Chaco Culture National Historical Park, is less about strenuous activity and more about absorbing the sights and sounds of the past. The trail, a loop, offers breathtaking views from the top of the mesa of much of the Chaco world. The trail begins with a steep climb up a cleft in the cliff. Once on top of the mesa, the trail meanders across bleached bedrock, embedded with fossils of long-ago sea creatures, before it winds its way back to that cleft in the rock. Access to this remote park is on dirt roads only, so plan accordingly. Be sure to stop at the Visitor’s Center for a free backcountry permit before you head out on the hike. This trail at White Sands National Monument is anything but flat, and the sand there isn’t even sand—it’s gypsum, but those are the only two things that aren’t what they seem on this five-mile round-trip trail. The dunes are indeed white un-dulating hills that will challenge you on the uphill, but excite you on the downhill slide … literally. A strenuous hike because of the slip sliding sand which works its way into your shoes, hiking some or all pf the trail is absolutely an option. Be sure to keep an eye out for the orange-topped white post trail markers. The shifting sands have a tendency to obscure their position. Take lots of water. Stands of White Pine, Ponderosa Pine, White Fir and Quaking Aspen surround you as you hike this trail through the White Mountain Wilderness, part of the Lincoln National Forest. Along the 6.3-mile out-and-back trail you might see elk and wild turkey wandering around the remnants of old mining operations. The ascent to the top is moderate but once there the view is breathtaking. Best time to go is May through November. If you hit the forest for the spring wildflower bloom there’s a good chance you’ll be treated to an explosion of color. On the outskirts of Santa Fe is this shady, leafy green seven-mile round-trip hike through the pinon scrub and ponderosa pine woodland of the Santa Fe National Forest. The single-track trail is in good shape and makes for a moderate climb until shortly before the peak where it kicks in to a steep grade to the crest. In Spanish, atalaya means watchtower, used as a place to spot fires. Today, hikers will see the blazing New Mexico skies from the mountain’s 9,000-foot peak and the radiance of the surrounding landscape. Best time to go, April through November. The lava flow of El Malpais National Monument lives up to its Spanish name, the badlands. This nine-mile hike, one-way, crosses the rugged terrain of this ancient molten rock, once cooled became a rough, uneven, somewhat treacherous trail. Cairns, chunks of lava piled and stacked around intermittent posts, point the way on this challenging trek. The footpath, at one time a connection between the Zuni and Acoma Pueblos hundreds of years ago, takes you past historic signs of the long-ago travelers, many hand-made bridges across deep crevasses connecting the past to the present. This is a wilderness so take lots of water and food and, unless you want to make a return trip, have someone standing by at the other end. Two pristine and remote alpine lakes, nestled in rock-lined bowls at the foot of a dramatic ridgeline, are the reward at the end of this, at times, arduous 10-mile round-trip hike. From the trailhead, it’s a moderate climb along the Trampas River and through open meadows and groves of Aspen trees. About three miles in, a series of switchbacks take you up to the lakes. From there, there’s a steep climb up to the ridge, but the views of Wheeler Peak and Truchas Peak in the distance are worth the effort. Summer and fall are the best times for this adventure. As you leave the Visitor’s Center on this rarely-traveled trail to the ruins, you will climb a steep path to the top of the mesa, then drop up and down into a number of smaller canyons and finally up again to the ruins. About 700 years ago, this area was populated by many ancestral Puebloan peoples and the ruin’s name means, “sacred enclosure,” which they are to the nearby Cochiti. The 12-mile trek has 3,000 feet of elevation gain so this is a commitment of time and energy. There’s no water, so take plenty. Best time is spring and fall—summer is hot! Picturesque is the way to describe this well-maintained four-mile loop trail. A moderate pace takes you through stands of Juniper, Pinon and Ponderosa Pines and offers spectacular views of the Organ Mountains and the Tularosa Basin. Chance spottings of mountain wildlife and blankets of spring wildflowers make this a fun outing. The trail is open year-round and each season brings it’s on challenges, but the route is kept in good condition, just check weather before heading out. There’s a $3 entrance fee to the campground. Don’t let the Sierra Ladrones, known as the “thieves’ mountains,” steal your vigor. If you’re going out to this area be aware the trail is unmarked so take a map and plenty of water and food for this challenging cross-country trek. The seven-mile round-trip is rugged but the surrounding landscape is impressive. Make for the two toothy ridges where you’ll be treated to some great views of the 45,000-acre wilderness. The area is accessible from March through November. The desert is changeable so be sure to check the weather. You’ll have to share the path on the multi-use trail with mountain bikers and dog owners and horseback riders on this well-used route, but the breadth of the Santa Fe National Forest has room enough for all. This 11-mile point-to-point trail (22 miles round-trip) has a little of everything—stands of trees, a burbling river, grassy meadows and, in the winter, snow. The terrain is difficult at times, with 3,500 feet of elevation gain. But the view of Lake Katherine can’t be beat. Best time here is April to early October. The trails here take you in, around, into and over parts of the volcano. They’re all fairly short and total about five miles. If you’re an armchair geologist than these easy walks/hikes will take you up-close-and-personal to an extinct cinder cone volcano. From the Rim Trail you’ll see 10 million years of New Mexico’s geological history in the form of cinder cones, pressure ridges, lava flows and Sierra Grande, an enormous shield volcano. Open year-round. View more New Mexico Hiking Trails.